A Mum, A Dad and Lucy: Nihilo sanc tum estne? Last night we were watching TV in the kitchen and a commercial came on for women's make-up. At first I wasn’t really paying attention until I heard a familiar tune. I look up from making the coffee for the next morning and I am shocked to hear that this make-up commercial is accompanied by the theme tune from the classic 80's series ‘Magnum P.I.’. Come on advertising people, how can you take something associated with such a manly show and apply it to a make-up commercial?! Nihilo sanc tum estne? Is nothing sacred? 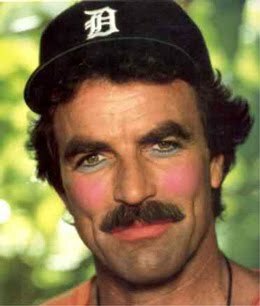 Poor Tom Selleck, how can he sleep at night? Somebody needs to set Apollo and Zeus on the creative team responsible for this atrocity.